The GOP did their best to try and make us all forget about the man who almost destroyed the economy, George W. Bush. We should also make the point that "W", along with Karl Rove and former closet case Ken Mehlman demonized the gay community, with several state anti gay marriage initiatives to win the 2004 election. Two days before their convention in Charlotte, North Carolina, Democrats are gearing up to present the election as a choice between President Obama’s vision for the future and a return to Bush era policies of the last decade. Democrats made the rounds on the Sunday talk shows to preview their re-election pitch to Americans, emphasizing that it would be a choice between going forward — their campaign slogan — and letting Mitt Romney double down on the policies of President George W. Bush that caused the economic downturn. 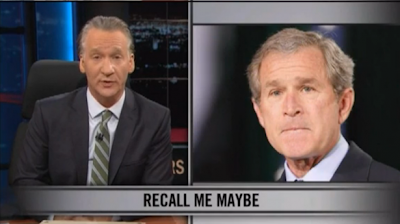 A Bill Maher segment makes the point that the GOP did their best to ignore the devastation that Bush caused. The DNC will be wise to remind every American about that devastation, because Romney wants to return to those same devastating policies.